In what may not be a coincidence, a string of nighttime fires have damaged or destroyed at least six predominately black churches in four southern states in the past week. Arsonists started at least three of the fires, while other causes are being examined in the other fires, investigators say. The series of fires – some of them suspicious and possible hate crimes -- came in the week following a murderous rampage by a white supremacist who shot and killed nine people at Emanuel AME Church in Charleston, S.C. The fires also occurred at a time when there is increasing public pressure to remove the Confederate flag – one of the last hallmarks of white superiority -- from government buildings and public places as well as banning assorted Confederate flag merchandise sold in retails stores and online. Even if the fires are deemed arson, it takes additional proof under reporting standards to conclude the act was a hate crime, investigators say. “As the nation grapples with the massacre at Emanuel AME Church in Charleston, S.C., one of the oldest Black churches in the South, other Black churches have become recent targets of arson,” writer David A. Love said today at Atlanta BlackStar. “From slavery and the days of Jim Crow through the civil rights movement and beyond, white supremacists have targeted the Black church because of its importance as a pillar of the Black community, the center for leadership and institution building, education, social and political development and organizing to fight oppression,” Love wrote. “Strike at the Black church, and you strike at the heart of Black American life,” the writer added. 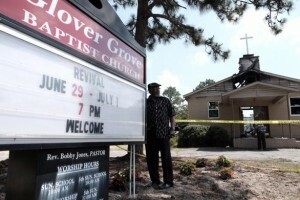 The most recent fires occurred early today at the Glover Grover Baptist Church, in Warrenville, S.C., and at the Greater Miracle Apostolic Holiness Church in Tallahassee, Fla.
Federal agents have been brought in to assist local officials in determining the unknown cause of the fire at the Glover Grove Baptist church. In Tallahassee, fire officials say the fire that totally destroyed the Apostolic Holiness Church may have been caused by a tree limb falling on overhead electrical lines. While those investigations continue, arson was determined to be the cause of three fires earlier in the week at other predominately black churches in the South. The first arson fire occurred in the early morning hours of Monday, June 22, at the College Hills Seventh Day Adventist Church, home to a predominately black congregation, in Knoxville, Tenn.
“Horror, I was like, ‘Oh my gosh, what’s going on? '” church Pastor Cleveland Hobdy III, told Knoxville television station WATE. Knoxville Fire Department spokesperson D.J. Corcoran said the arsonist set fires at multiple locations on the church property, including igniting bales of hay left at the church’s door. The church’s van also was burned. The following day, Tuesday June 23, an arsonist was blamed for a fire in the sanctuary s at God’s Power Church of Christ in Macon, Ga.
“Right now we are investigating as if it was a set fire,” said Sgt. Ben Gleaton, an arson investigator for the Macon-Bibb County Fire Department, told the Macon Telegraph. Investigators from the Bureau of Alcohol, Tobacco, Firearms and Explosives and the Georgia Bureau of Investigations are following leads in that suspect arson. The church on Cedar Avenue in Macon has been the repeated target of burglars who have stolen sound and air conditioning equipment, the Macon newspaper reported. 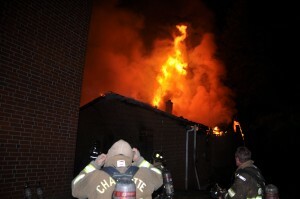 The third suspected arson fire occurred in the predawn hours of Wednesday, June 24, at the Briar Creek Baptist Church in Charlotte, N.C.
That fire, reported at 1 a.m. EDT, caused an estimated $250,000 in damage, destroying an education wing in one of four buildings that make up the Briar Creek Road Baptist Church complex in east Charlotte, authorities said. The church’s sanctuary and gymnasium sustained heavy smoke damage. The church has about 100 members, most of them African Americans, but it also shares space with two churches for immigrants from Nepal, according to media reports. Also on Wednesday, fire destroyed the Fruitland Presbyterian Church, in Gibson County, Tenn., a landmark structure built in the 1800s. While the cause of that fire remains under investigation, preliminary reports suggest it may have been caused by a lightning strike, television station WBBJ reported. The Tennessee State Fire Marshal’s Office and ATF agents continue an investigation to determine the fire’s cause. “We want to be sure, 100 percent sure, that this was an accidental fire, not on purpose,” Gibson County Fire Chief Bryan Cathey told the television station.